Because the GOP has a majority in the Senate, it also has a majority on all Senate committees — 12 to 9 in the case of the Judiciary Committee. But since Lynch’s confirmation has become a referendum on executive amnesty and the GOP is riddled with amnesty shills, there was no doubt that a few would cross over and vote with Democrats today to send her through to a floor vote of the entire Senate. The three defectors: Jeff Flake and Lindsey Graham, both members of the Senate’s Gang of Eight on immigration, and Orrin Hatch, who sold himself as Mr. Conservative to Utah tea partiers in 2012 in order to avoid being primaried. Democrats expressed dismay that Ms. Lynch, whose record they praised repeatedly, encountered so much opposition, especially since Republicans had cited virtually nothing objectionable in her background. “If anyone deserves a unanimous vote, she does,” said Sen. Dianne Feinstein (D., Calif.). The committee vote means Ms. Lynch will likely be considered by the full Senate in the coming weeks. There, she will need to win the support of at least four Republicans to be confirmed, assuming all of the chamber’s 46 Democrats vote for her. Remember, there’s no filibuster anymore for presidential nominees except for Supreme Court vacancies. McConnell could have brought back the 60-vote rule for cloture on nominations that Harry Reid abandoned but he’s kept it in place. That’ll be useful to the GOP if/when a Republican president nominates someone “controversial” and the Democrats, eager to Bork him, run up against the now entrenched “simple majority” requirement for appointees. Until then, though, it’s a big help to Obama in reducing the leverage tea partiers have to block cloture on his nominees. With Flake, Graham, and Hatch all presumably set to vote for her, all Reid needs now is one more Republican to ensure Lynch is confirmed. (If the vote splits 50/50, Joe Biden would cast the tiebreaker.) Between the usual suspects like Mark Kirk, Susan Collins, Lisa Murkowski, and Dean Heller, he’ll get it. 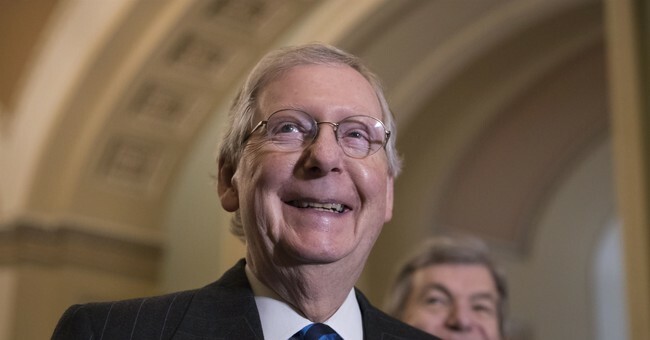 Come to think of it, given his performance these past few weeks in handling the DHS funding debacle, the current rule is actually a big help to McConnell too. Imagine how jammed up the Senate would be if the filibuster was still intact and Ted Cruz was able to round up, say, 43 Republicans to oppose Lynch. McConnell would be humiliated by having lost his own caucus and paralyzed as Cruz et al. attacked him for being a RINO while the White House attacked his caucus for being racist in refusing to confirm the first black woman AG. Anything that reduces conservatives’ leverage in the Senate is good for Obama and McConnell, who’s eager to show voters that the party can govern smoothly, without shutdowns and filibusters. Maybe I’m being unrealistic, though, in thinking conservatives could have blocked Lynch if the filibuster was still available. Lynch will probably end up being confirmed with less than 60 votes, not because lots of Republicans are strongly opposed to her but merely because, now that her confirmation is assured, the safe vote for a GOPer is to vote no and ingratiate yourself with the right. John McCain, for instance, now seems to be leaning against voting for Lynch after sounding positive about her initially, a rare case in which he and Graham are on opposite sides. Is that because Maverick, who’s been encouraging McConnell to punt on DHS funding, has some deep principled objection to executive amnesty? Of course not. It’s because he knows his vote won’t be needed to get Lynch to 50. If it was, he’d probably bite the bullet and vote yes; as it is, with a tough Senate primary in Arizona looming for him in 2016, he’s going to bank some goodwill with righties by voting no. If McConnell needed 60 votes to move Lynch through the chamber, I’m sure there would have been more than enough Republicans like McCain willing to help out, however reluctantly, to get him out of a jam. Lynch was always going to make it. The GOP simply doesn’t care enough about punishing Obama for his immigration power grab to try to stop her, especially given the easy racial narrative that the media would have fashioned from her rejection. Exit question via DrewM: Why doesn’t McConnell simply refuse to bring Lynch’s nomination to the floor? If he’s serious enough about blocking Obama’s amnesty that he’d force a vote on the House’s DHS funding bill four times, he’s surely serious enough to bottle up Obama’s nominee for Attorney General. Right?